and the Act of Contrition. V: We adore You, oh Christ, and we bless You. 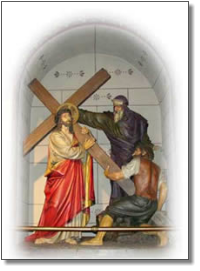 R: Because by Your holy Cross You have redeemed the world. Consider, that Jesus, after having been scourged and crowned with thorns, was unjustly condemned by Pilate to die on the cross. 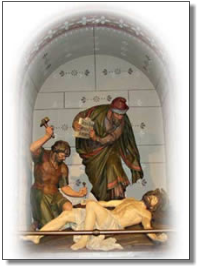 My adorable Jesus, it was not Pilate, no, it was my sins, that condemned You to die. I beseech You, by the merits of this sorrowful journey, to assist my soul in its journey toward eternity. I love You, my beloved Jesus; I love You more than myself; I repent with my whole heart of having offended You. Never permit me to separate myself from You again. Grant that I may love You always; and then do with me what You will. All say: Our Father, Hail Mary, Glory Be. 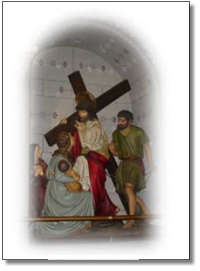 Consider, that Jesus, in making this journey with the cross on His shoulders, thought of us, and offered for us, to His Father, the death that He was about to undergo. 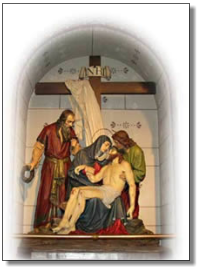 My most beloved Jesus, I embrace all the tribulations that You have destined for me until death. I beseech You, by the merits of the pain You suffered in carrying Your cross, to give me the necessary help to carry mine with perfect patience and resignation. I love You, Jesus, my love, I repent of having offended You. Never permit me to separate myself from You again. Grant that I may love You always, and then do with me what You will. 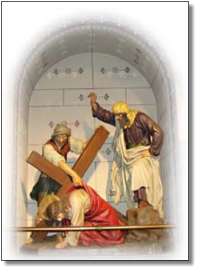 Consider, this first fall of Jesus under His cross. 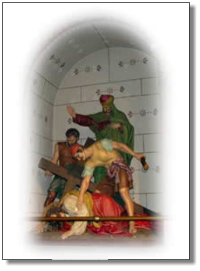 His flesh was torn by the scourges, His head crowned with thorns, and He had lost a great quantity of blood. He was so weakened that He could scarcely walk, and yet He had to carry this great load upon His shoulders. The soldiers struck Him rudely, and thus He fell several times in His journey. 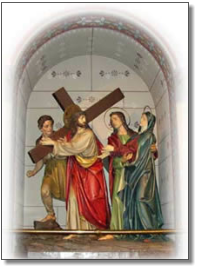 My beloved Jesus, it is not the weight of the cross, but of my sins, which has made You suffer so much pain. Ah, by the merits of this first fall, deliver me from the misfortune of falling into mortal sin. I love You, O my Jesus, with my whole heart; I repent of having offended You. Never permit me to offend You again. Grant that I may love You always; and then do with me what You will. 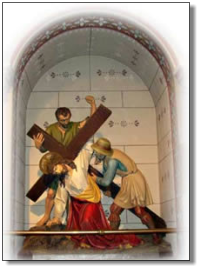 Consider that the Jews seeing that at each step Jesus, from weakness, was on the point of expiring, and fearing that He would die on the way when they wished Him to die the ignominious death of the cross, constrained Simon the Cyrenian to carry the cross behind Our Lord. My most sweet Jesus, I will not refuse the cross as the Cyrenian did; I accept it, I embrace it. I accept in particular the death that You have destined for me with all the pains which may accompany it; I unite it to Your death, I offer it to You. You have died for love of me, I will die for love of You, and to please You. Help me by Your grace. I love You, Jesus, my love; I repent of having offended You. Never permit me to offend You again. Grant that I may love You always, and then do with me what You will. Christ's dear Mother to behold? In that Mother's pain untold? Consider the second fall of Jesus under the cross—a fall which renews the pain of all the wounds of the head and members of our afflicted Lord. My most gentle Jesus, how many times You have pardoned me, and how many times have I fallen again, and begun again to offend You! Oh, by the merits of this new fall, give me the necessary helps to persevere in Your grace until death. Grant that in all temptations which assail me I may always commend myself to You. I love You, Jesus, my love, with my whole heart; I repent of having offended You. Never permit me to offend You again. Grant that I may love You always; and then do with me what You will. Consider that those women wept with compassion at seeing Jesus in so pitiable a state, streaming with blood, as He walked along. But Jesus said to them, "Weep not for Me but for your children." My Jesus, laden with sorrows, I weep for the offenses that I have committed against You, because of the pains which they have deserved, and still more because of the displeasure which they have caused You, Who have loved me so much. It is Your love, more than the fear of hell, which causes me to weep for my sins. My Jesus, I love You more than myself; I repent of having offended You. Never permit me to offend You again. Grant that I may love You always; and then do with me what You will. Consider the third fall of Jesus Christ. His weakness was extreme, and the cruelty of His executioners excessive, who tried to hasten His steps when He had scarcely strength to move. Ah, my outraged Jesus, by the merits of the weakness You suffered in going to Calvary, give me strength sufficient to conquer all human respect and all my wicked passions, which have led me to despise Your friendship. I love You, Jesus, my love, with my whole heart; I repent of having offended You. Never permit me to offend You again. Grant that I may love You always; and then do with me what You will. My innocent Jesus, by the merits of the torment which You have felt, help me to strip myself of all affection to things of earth, in order that I may place all my love in You, Who are so worthy of my love. I love You, O Jesus, with my whole heart: I repent of having offended You. Never permit me to offend You again. Grant that I may love You always; and then do with me what You will. Consider that Jesus, after being thrown on the cross, extended His hands, and offered to His eternal Father the sacrifice of His life for our salvation. These barbarians fastened Him with nails; and then, raising the cross, left Him to die with anguish on this infamous gibbet. My Jesus, loaded with contempt, nail my heart to Your feet, that it may ever remain there to love You, and never quit You again. I love You more than myself; I repent of having offended You. Never permit me to offend You again. Grant that I may love You always; and then do with me what You will. 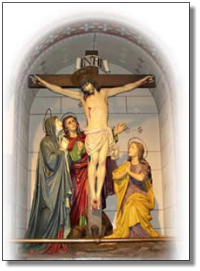 Consider how Your Jesus, after three hours of agony on the cross, consumed at length with anguish, abandons Himself to the weight of His body, bows His head, and dies. 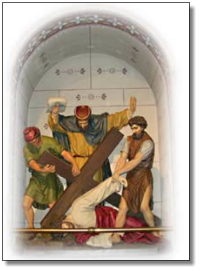 O my dying Jesus, I kiss devoutly the cross on which You died for love of me. 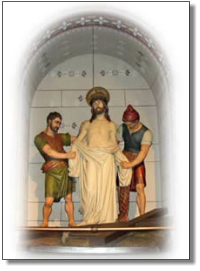 I have merited by my sins to die a miserable death, but Your death is my hope. Ah, by the merits of Your death, give me grace to die, embracing Your feet and burning with love of You. I commit my soul into Your hands. I love You with my whole heart; I repent of ever having offended You. Never permit me to offend You again. Grant that I may love You always; and then do with me what You will. 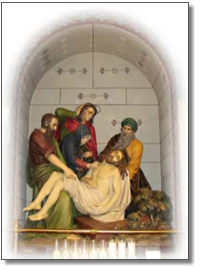 Consider that, our Lord having expired, two of His disciples, Joseph and Nicodemus, took Him down from the cross, and placed Him in the arms of His afflicted Mother, who received Him with unutterable tenderness, and pressed Him to her bosom. 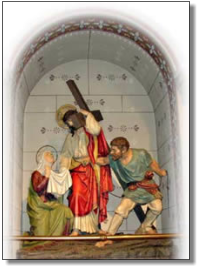 Consider that the disciples carried the body of Jesus to bury it, accompanied by His holy Mother, who arranged it in the sepulcher with her own hands. They then closed the tomb and all withdrew. 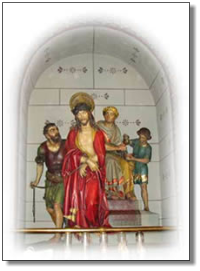 Oh, my buried Jesus, I kiss the stone that encloses You. But You rose again the third day. I beseech You, by Your resurrection, make me rise glorious with You at the last day, to be always united with You in heaven, to praise You and love You forever. I love You, and I repent of ever having offended You. Never permit me to offend You again. Grant that I may love You; and then do with me what You will. Behold, O kind and most sweet Jesus, I cast myself on my knees in Your sight, and with the most fervent desire of my soul, I pray and beg You to impress upon my heart lively sentiments of faith, hope, and charity, with true repentance for my sins, and a firm desire of amendment, while with deep affection and grief of soul I contemplate Your five most precious Wounds, having before my eyes that which David spoke in prophecy: "They pierced My hands and My feet; they have numbered all My bones." God has loved us from all eternity. So He says: "Remember I first loved you. You had not come to be, nor did the world yet exist, but I loved you already. From all eternity I have loved you."